Truly, one of NZ's best locations. This is a permanent position commencing 2018. We’re seeking a Consultant General and Oncological Breast Surgeon to be based in a 359 bed Level 2 District General Hospital in Tauranga, one of NZ's fastest growing cities. You will have broad experience and skills across General Surgery and Oncological Breast Surgery, along with a sound understanding of contemporary models of care; proven leadership skills and experience working in a multidisciplinary team environment; an interest in medical education and teaching; and a commitment and willingness to be involved in continuous quality improvement programmes. The Bay of Plenty District Health Board delivers services to a catchment area spanning from Waihi Beach down to Whangaparaoa on the coastline and inland to the Urewera, Kaimai and Mamaku ranges. This incorporates the towns and cities of Tauranga, Katikati, Te Puke, Whakatāne, Kawerau and Opotiki. The Bay of Plenty District Health Board has two main sites. Tauranga Hospital (359-bed) provides health services to the people of the Western Bay of Plenty. A secondary hospital, it provides level 4-5 services including medical, surgical, paediatrics, obstetrics, gynaecology and mental health. Whakatane Hospital (110-bed) is approx. a 1 hour drive from Tauranga and covers the Eastern Bay of Plenty. Within this role, there will be a requirement to also work in Whakatane from time to time as part of the delivery of a district-wide General Surgical service. Tauranga is now the 5th largest city in New Zealand with an urban population of 170,000 (regionally 230,000) and is only a short drive south of Auckland. It has always been a premier destination, but with a strong NZ economy and a very buoyant housing market with many beach frontage properties and luxury apartments, Tauranga is now the fastest growing city in New Zealand. Tauranga - and in particular the suburb of Mount Maunganui - is well known across NZ for many things; the relaxed lifestyle, the sunshine, the café scene, the surfing, the white sandy beaches and natural salt water hotpools, and the safe and family-friendly lifestyle with excellent schools. It attracts families of all ages into the area and is a holiday favourite for visitors. In 2018, Mount Maunganui was voted Beast Beach on Trip Advisor New Zealand. Also in the Top 10 Beaches are Papamoa and Ohope - all here in the same region. 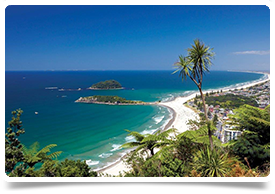 In the summertime, the population swells and holidaymakers and international travellers come to Tauranga and Mount Maunganui to enjoy the beach and sun. There’s a real buzz about the place, especially over Christmas, New Year and the January School holidays. A large number of cruise ships berth in Tauranga from October to April (the 2016/17 season had 83 cruise ships visiting with a passenger population of approx. 150,000). For more details about this job, please contact Caroline at caroline@headmedical.com with a copy of your CV. Please note, Caroline is based in New Zealand, having made the move with her family from the UK in September 2017. Tauranga is her hometown. Ideally you will hold FRACS and full Vocational registration with Medical Council of New Zealand (MCNZ). Alternatively, if not NZ trained or based, you will hold equivalent specialist qualifications from either UK & Ireland (via CCT), Australia, Canada, South Africa or USA that will enable Provisional Vocational (long term) registration or Locum Tenens (short term up to 12 months) registration. These are the specialist pathways for medical registration in NZ for General Surgeons. A further registration pathway may be applicable if you are an overseas trained General Surgeon with at least 33 months (out of the last 48 months) specialist/ consultant level experience from a country considered to have a comparable health system by The Medical Council of New Zealand (click on the link to check if your experience is applicable). Please visit the MCNZ website for details on the medical registration requirements, including primary source verification of your qualifications which was introduced by MCNZ 1st November 2017. If not currently based in NZ but you are interested in working here, please note all relevant medical qualifications must now be verified by ECFMG using the EPIC system on behalf of the Medical Council of New Zealand. We recommend starting this off during the recruitment process, so it is already underway early on especially if you hold qualifications from locations other than NZ, Australia, UK, USA or Canada. Candidates can log on to EPIC and complete this step online very easily. Starting this as early as possible will prevent delays if your University or Medical Specialist College do not respond quickly to verification requests from ECFMG via EPIC. Please note, if appointed, any qualification NOT verified by the time your medical registration and work visa has been approved, may prevent you from being able to commence work in NZ on your agreed start date.